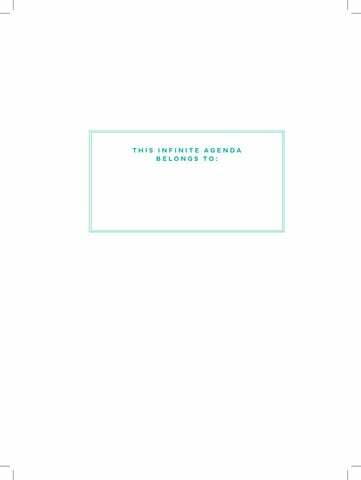 MANIFEST INCREDIBLE CHANGES IN YOUR LIFE My Infinite Agenda unites your vision board and daily planner; it is a tool to help you focus your thoughts, and manifest whatever you are working towardâ&#x20AC;&#x201D;from your practical goals to your deepest desires. 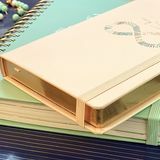 Here you will record your daily ideas and dreams, all while keeping up with your day-to-day tasks. What you focus your mind on, you attract. You have the power to shape your thoughts, and therefore can set your mind on fulfilling whatever your heart desires. Thoughts become things when you visualize and declare your aspirations. Infinite winnings are yours when you ask, believe, and are ready to receive. Start writing your destiny today. more of what enriches me. long-terms goals, and wildest dreams, so that they will grow, flourish, and reach fruition. that take root in my life. 7 I will ask, believe, and receive; I trust that what is meant for me will not pass me by. start here Complete these prompts to outline your gratitude, short-term goals, longterm goals, and wildest dreams. Thoughts recorded in this section will help you figure out what your biggest vision-priorities are. The goal is to bring all your positive aspirations to the forefront of your mind so they can be realized. Over the next year, your focus and what you want to manifest into your life will be inspired by these brainstorming sections. WHAT ARE YOUR SHORT-TERM GOALS? Make it easy. What are your urgent, must-not-ignoreit-any-longer short-term goals? Breathe. Think clearly. What would you like to see happen tomorrow? Or next week? To start manifesting, begin by writing down your immediate desires. Are you hoping for a successful interview in the morning? Do you want to eat a healthy dinner? Are you wishing for more free time? Write down your simple wishes for today, tomorrow, or things you want to have happen later this week. Get started now, and you can return to these shortterm goals as they grow and change. Remember to use positive statements! LONG-TERM GOALS... Now, take it one step further. What are your longterm goals? What do you want to have in your life one year from now? Five years from now? Is there a travel destination you have always dreamed of ? A relationship you wish to cultivate? A promotion you want to earn? Write down your hopes and be creative! Donâ&#x20AC;&#x2122;t limit yourself. Continue adding to this list throughout the year. Dream big or go home! N E X T Y E A R I S E E M Y S E L F.. .
WHAT WOULD YOU ASK FOR IN YOUR WILDEST DREAMS? Here is the really fun part! Take a few minutes to imagine things you can only dream of experiencing— your biggest wishes, hidden desires, and deepest longings. Maybe you think they are so impossible you haven’t dared to speak them aloud, or even let them linger into your conscious mind. Here is your chance to plant the seeds of those dreams. Write them all down! No matter how crazy or farfetched they may seem. This is an exercise to get your infinite imagination working. Remember: ask and you shall receive, so dream without limiting any of the possibilities. Keep building this list throughout the year as inspiration strikes. W H E N I A L LO W M Y I M A G I N AT I O N T O R U N W I L D, I S E E M Y S E L F. ..
“You don’t have to see the whole staircase, just take the first step.” — M A RT I N LU T H E R K I N G , J R .
BUILD YOUR VISION BOARDâ&#x20AC;Ś The last step to manifesting your dreams into existence is to start envisioning and believing in them. Vision boards are a creative, fun, and powerful way to visually organize your thoughts and goals all in one place. Reflect on the aspirations you wrote down on previous pages. Start to look for, cut out, and collect visual representations of what you want to manifest into your life. These could be pictures or words from magazines, drawings, newspapers, or any other images that inspire you! Is there an experience you wish to have? A beautiful place you want to live? A person you wish to meet? Accomplishments you would like to achieve? All of these could be included on the next few vision board pages where you have the opportunity to visually blend your short-term goals, long-term goals, and wildest dreams in one place. These pages will serve as illustrations of what you wish to attract into your life. You can keep adding to them throughout the year, so start collecting and have a blast! T H I S M O N T H I A M E XC I T E D T O A C C O M P L I S H T H E S E S H O RT-T E R M G O A L S . . .
T H I S M O N T H I W I L L G R O W C LO S E R T O T H E S E LO N G -T E R M G O A L S . . . I N M Y W I L D E S T D R E A M S I A M LO O K I N G F O RWA R D T O R E C E I V I N G . . .
T O D AY I A M LO O K I N G F O RWA R D T O. . .
T O D AY I A M S U P E R G R AT E F U L F O R . . .
"Something beautiful is on the horizon." "Laugh at yourself, but don’t ever aim your doubt at yourself . . . Be bold." "You are enough. You are so enough. It is unbelievable how enough you are." "Don’t wait. The time will never be just right." T H I S M O N T H â&#x20AC;&#x2122; S I N F I N I T E W I N N I N G S . ..
Use this section at the end of each month to track goals and dreams that have come to fruition. These are your infinite winnings! Take some time to reflect on them here, and soon many more will be coming your way! "Every hour of the light and dark is a miracle." "You may delay, but time will not, and lost time is never found again." "The sun shines not on us, but in us." "You'll never find rainbows if you’re looking down." "Big shots are only little shots who keep shooting." "Daydreaming is a mandatory daily exercise." "Learn from your history but do not live in it." "They say if you dream a thing more than once it's sure to come true." "So give me hope in the darkness that I will see the light." "Live in faith, not fear." "You are capable of more than you know." "We must ask ourselves . . . are we willing to show up and be seen?" "The important thing is to somehow believe." "We need to be visionary; we have to be bold." "Life is tough, my darling, but so are you." "Whether you think you can, or think you can’t, you’re right." "Be bold, be bold, and everywhere be bold." "Every single day do something that makes your heart sing." "The question isn’t who is going to let me; it’s who is going to stop me." "Your speed doesn't matter. Forward is forward." "You may be disappointed if you fail, but you are doomed if you don’t try." "Build your own dreams, or someone else will hire you to build theirs." "You can make anything happen if you put your mind to it." "Choose people who lift you up." "Have the courage to believe in yourself and you'll be amazed what can happen." "Setting goals is the first step in turning the invisible into the visible." "The cost of not following your heart, is spending the rest of your life wishing you had." "It's a great day to have a great day." "The best way to not feel hopeless is to get up and do something." "Our intention is everything. Nothing happens on this planet without it." "Big thinking precedes great achievement." "Be a warrior, not a worrier." "An open heart, is an open mind." "Do all you can to make your dreams come true." "By perseverance, everything reaches its target." "You have the courage and power to live your dreams." "Say yes and you'll figure it out after." "Each morning we are born again." "You never do a whole lot unless you’re brave enough to try." "Don't be pushed by your problems, be led by your dreams." "Turn your nays into yays." "Begin, be bold, and venture to be wise." "In thickest darkness the stars shine brightest." "You are in charge of your own happiness." "Always believe that something wonderful is about to happen." "Being at ease with not knowing is crucial for answers to come to you." "Keep your head up. Keep your heart strong." "To plant a garden is to believe in tomorrow." "But you have to do what you dream of doing even while you're afraid." "With a new day comes new strengths and new thoughts." "Positive Mind. Positive Vibes. Positive Life." "It's not the years in your life that count. It's the life in your years." "Make each day your masterpiece." "I think fearless is having fears but jumping anyway." "Great dreams of great dreamers are always transcended." "The very purpose of our life is to seek happiness." "Ask and it will be given to you, seek and you will find, knock and the door will be opened to you." "Don't look back . . . you're not going that way." "When you reach the end of your rope, tie a knot in it and hang on." "Buy the ticket; take the ride." "Infinite winnings are coming your way." "Be in love with your life . . .every minute of it." "Trial often exhibits truly wonderful results." This Year in Review Take some time to reflect on 2018. Scan through your agenda and review your statements of gratitude, short-term goals, long-term goals, and wildest dreams. Which of these became infinite winnings? What are you most grateful for? What are you still working toward? What are your aspirations for 2019? Now go forth and continue your awesomeness INFINITE WINNINGS ARE COMING YOUR WAY! My Infinite Agenda was inspired, in part, by the following list of books. Check them out for some good vibes!